A House hearing Tuesday examining time-and-attendance abuses at the U.S. Patent and Trademark Office highlighted ongoing disagreement about the scope of the problem and the implications for telework governmentwide. Agency witnesses insisted they had gotten a handle on widely reported issues, including misrepresentation of hours and rushed work by patent examiners. But the two chairmen at the joint hearing disagreed with that assessment, and an inspector general testified that an internal probe of the abuses understated the problem. The IG also noted several ongoing investigations at USPTO. Though the Patent and Trademark Office for more than a decade has enjoyed a reputation as a model for federal telecommuting, it came under fire in August when a pair of draft internal reports were leaked to the Washington Post, suggesting that an initial report finding serious abuses had been “filtered” to make the problem seem less systemic. The alleged abuses by some among the agency’s 8,500 patent examiners included submitting time cards overstating hours worked; “end-loading” (holding off on work until the final days of a reporting quarter and thereby harming quality); and “mortgaging,” or submitting time-card claims for work not yet completed. House Judiciary Committee Chairman Bob Goodlatte, R-Va., said he found it disturbing last summer when “cracks began to appear in the agency’s façade.” Revelations that mid-level managers were not being permitted to investigate the alleged abuses “called into question the agency officials’ statements that the problems were isolated and not systemic,” he said. 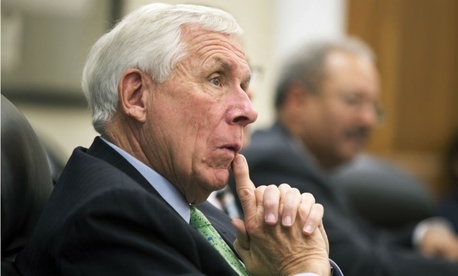 Retiring Rep. Frank Wolf, R-Va., appearing as a witness and calling himself “a huge advocate of telework,” was tough on the agency. He said he had “expressed displeasure” to Commerce Secretary Penny Pritzker and asked for a criminal investigation by the U.S. Attorney for the Eastern District of Virginia, “if the PTO and the Commerce Department fail to terminate those employees that abused the system.” The abuses mean “other telework programs across the government could very well be in jeopardy,” Wolf testified. Todd Zinser, the Commerce Department inspector general whose past reports have faulted the Patent agency for other time-and attendance abuses, agreed that the internal reports had been altered “significantly” to exclude the results of interviews with disgruntled managers. The agency’s shift from emphasizing “time and attendance” to quotas and productivity has come at a price, Zinser’s audits have shown. Investigators found that over the last four fiscal years, 15 percent to 20 percent of examiners end-loaded in any given quarter, he testified. “Unfortunately, USPTO is unable to track all of the quality errors that result from end-loading,” he said. Budens said it would be impossible for USPTO to examine 600,000 patent applications and issue 300,000 patents, as it did in fiscal 2014, and yet have “thousands” of examiners getting paid for work they did not do. He pointed out that patent examining does not require being physically parked in front of a computer, given that the “demanding work” also requires reading and phone calls. The professional association “strongly disagrees with any assertion that the USPTO has some sort of systemic plague of poorly performing employees,” he said. “We do understand, however, that any organization of 12,000-plus employees, whether public sector or private sector, will have some employees who run into difficulties in the workplace.” Such problems are routinely addressed by “a series of progressive disciplinary measures coupled with opportunities for improving their performance,” he testified. Attorney William F. Smith, who spent three decades at the Patent Office, proposed more requirements for face-to-face interviewing between examiners and applicants, and he suggested a new time-keeping software system that tracks time by application number. An anonymous complaint that a patent examiner bragged about producing zero work products for six months, with no punishment.